Are you eco-conscious and interested in contemporary art? Will you be in 10th, 11th or 12th grade during the 2019-20 school year? Do you want to take action to protect the environment and communicate your perspective? Art & Ecology: Youth is a free program during the fall semester that is open to high school sophomores, juniors and seniors in the central Ohio area. 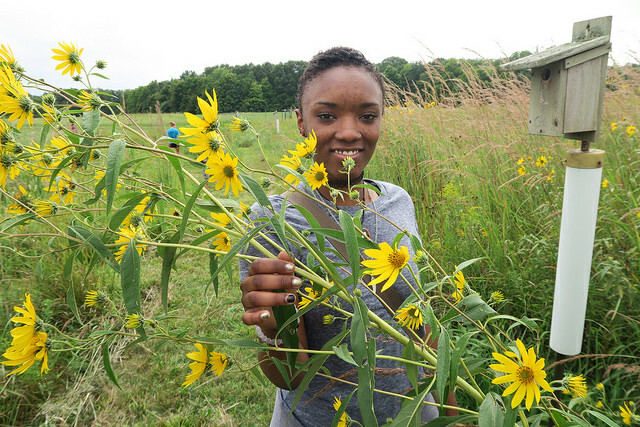 Students will learn how artists, scientists, and activists are working to protect our natural environment by meeting and interviewing practicing artists and by visiting environmental research and service sites around central Ohio. Students’ research will culminate in final art projects that will be exhibited at the Wexner Center in December 2019. The course is free to those admitted and comes with transportation assistance, free books, and supplies. Class is held once per week at the Wexner Center at OSU or off-site at field trip locations. Regular computer access is essential for students of this course as much of the work is completed online. Students must secure parental and teacher approval for school building absence on class days. High school course credit is arranged with individual school systems through the State of Ohio’s Flex Credit policy. Art & Environment at the Wexner Center from Wexner Center for the Arts on Vimeo. Applications are still being taken on a first come, first served basis. Apply here. Art & Ecology is presented with major support from American Electric Power. Teacher and school programs are also presented with support from Ingram-White Castle Foundation, Martha Holden Jennings Foundation, Ohio Arts Council, Puffin Foundation West, Ltd., and the Milton and Sally Avery Arts Foundation. Art & Ecology and other free and low-cost programs are presented with support from Huntington Bank and Cardinal Health Foundation. The Wexner Center receives general operating support from the Greater Columbus Arts Council, the Ohio Arts Council, The Columbus Foundation, and Nationwide Foundation. Generous support is also provided by the Corporate Annual Fund of the Wexner Center Foundation and Wexner Center members.